Transcript And Audio: Vice Presidential Debate Transcript of the debate between Vice President Biden and Rep. Paul Ryan, R-Wis.
Vice President Joe Biden and Rep. Paul Ryan, R-Wis., participate in the vice presidential debate, moderated by Martha Raddatz of ABC News, Thursday in Danville, Ky.
MARTHA RADDATZ: Good evening, and welcome to the first and only vice presidential debate of 2012, sponsored by the Commission on Presidential Debates. I'm Martha Raddatz of ABC News, and I am honored to moderate this debate between two men who have dedicated much of their lives to public service. Tonight's debate is divided between domestic and foreign policy issues. And I'm going to move back and forth between foreign and domestic since that is what a vice president or president would have to do. VICE PRESIDENT JOE BIDEN: How you doing? MS. RADDATZ: Hey, you got your little wave to the families in. That's great. I would like to begin with Libya on a rather somber note. One month ago tonight, on the anniversary of 9/11, Ambassador Chris Stevens and three other brave Americans were killed in a terrorist attack in Benghazi. The State Department has now made clear there were no protesters there. It was a pre-planned assault by heavily armed men. Wasn't this a massive intelligence failure, Vice President Biden? VICE PRESIDENT BIDEN: What it was, it was a tragedy, Martha. It — Chris Stevens was one of our best. We lost three other brave Americans. And secondly, we will get to the bottom of it, and whatever — wherever the facts lead us, wherever they lead us, w will make clear to the American public, because whatever mistakes were made will not be made again. When you're looking at a president, Martha, it seems to me that you should take a look at his most important responsibility. That's carrying forward the national security of the country. And the best way to do that is take a look at how he's handled he issues of the day. On Iraq, the president said he would end the war. Governor Romney said that was a tragic mistake; we should have left — that he ended it — Governor Romney said that was a tragic mistake; we should have left 30,000 troops there. When it came to Osama bin Laden, the president, the first day in office — I was sitting with him in the Oval Office. He called in the CIA and signed an order saying, my highest priority is to get bin Laden. Prior to the election, prior to the — him being sworn in, Governor Romney was asked a question about how he would proceed. He said, I wouldn't move heaven and earth to get bin Laden. He didn't understand it was more than about taking a — a murderer off the battlefield; it was about restoring America's heart and letting terrorists around the world know if you do harm to America, we will track you to the gates of hell, if need be. And lastly, the — the president of the United States has — has led with a steady hand and clear vision. Governor Romney, the opposite. The last thing we need now is another war. REP. PAUL RYAN: (Sighs.) We mourn the loss of these four Americans who were murdered. When you take a look at what has happened just in the last few weeks, they sent the U.N. ambassador out to say that this was because of a protest and a YouTube video. It took the president two weeks to acknowledge that this was a terrorist attack. He went to the U.N., and in his speech at the U.N. he said six times — he talked about the YouTube video. Look, if we are hit by terrorists, we're going to call it for what it is, a terrorist attack. Our ambassador in Paris has a Marine detachment guarding him. Shouldn't we have a Marine detachment guarding our ambassador in Benghazi, a place where we knew that there was an al-Qaida cell with arms? This is becoming more troubling by the day. They first blamed the YouTube video; now they're trying to blame the Romney-Ryan ticket for making this an issue. And with respect to Iraq, we had the same position before the withdrawal, which was we agreed with the Obama administration: Let's have a Status of Forces Agreement to make sure that we secure our gains. The vice president was put in charge of those negotiations by President Obama, and they failed to get the agreement. We don't have a Status of Forces Agreement because they failed to get one. That's what we are talking about. And when it comes to our veterans, we owe them a great debt of gratitude for what they've done for us, including your son Beau. But we also want to make sure that we don't lose the things we fought so hard to get. And with respect to Afghanistan and the 2014 deadline, we agree with a 2014 transition. But what we also want to do is make sure that we're not projecting weakness abroad, and that's what's happening here. This Benghazi issue would be a tragedy in and of itself. But unfortunately it's indicative of a broader problem, and that is what we are watching on our TV screens is the unraveling of the Obama foreign policy, which is making the world more — more chaotic and us less safe. MS. RADDATZ: I just want to talk to you about right in the middle of the crisis. Governor Romney — and you're talking about this again tonight — talked about the weakness, talked about apologies from the Obama administration. Was that really appropriate right in the middle of the crisis? REP. RYAN: On that same day, the Obama administration had the exact same position. Let's recall that they disavowed their own statement that they had put out earlier in the day in Cairo. VICE PRESIDENT BIDEN: I will be very specific. Number one, the — this lecture on embassy security — the congressman here cut embassy security in his budget by $300 million below what we asked for, number one. So much for the embassy security piece. Number two, Governor Romney, before he knew the facts, before he even knew that our ambassador was killed, he was out making a political statement which was panned by the media around the world. And this talk about this — this weakness, I — I don't understand what my friend's talking about here. We — this is a president who's gone out and done everything he has said he was going to do. This is the guy who's repaired our alliances so the rest of the world follows us again. This is the guy who brought the entire world, including Russia and China, to bring about the most devastating, most devastating — the most devastating efforts on Iran to make sure that they in fact stop with their — look, I — I — I just — I mean, these guys bet against America all the time. MS. RADDATZ: Can we talk about — let me go back to Libya. VICE PRESIDENT BIDEN: Well, we weren't told they wanted more security again. We did not know they wanted more security again. And by the way, at the time we were told exactly — we said exactly what the intelligence community told us that they knew. That was the assessment. And as the intelligence community changed their view, we made it clear they changed their view. That's why I said, we will get to the bottom of this. You know, usually when there's a crisis, we pull together. We pull together as a nation. But as I said, even before we knew what happened to the ambassador, the governor was holding a press conference — was holding a press conference. That's not presidential leadership. MS. RADDATZ: Mr. Ryan, I want to ask you about — the Romney campaign talks a lot about no apologies. He has a book called No Apologies. Should the U.S. have apologized for Americans burning Qurans in Afghanistan? Should the U.S. apologize for U.S. Marines urinating on Taliban corpses? MS. RADDATZ: Burning Qurans (immediately?)? REP. RYAN: What — what we should not be apologizing for are standing up for our values. What we should not be doing is saying to the Egyptian people, while Mubarak is cracking down on them, that he's a good guy and then the next week say he ought to go. What we should not be doing is rejecting claims for — calls for more security in our barracks, in our Marine — we need Marines in Benghazi when the commander on the ground says we need more forces for security. MS. RADDATZ: — this country is facing. Both President Obama and Governor Romney have said they will prevent Iran from getting a nuclear weapon, even if that means military action. Last week former Defense Secretary Bob Gates said a strike on Iran's facilities would not work and, quote, could prove catastrophic, haunting us for generations. Can the two of you be absolutely clear and specific to the American people how effective would a military strike be? Congressman Ryan. Now, let's take a look at where we've gone — come from. When Barack Obama was elected, they had enough fissile material, nuclear material, to make one bomb. Now they have enough for five. They're racing toward a nuclear weapon. They're four years closer toward a nuclear weapons capability. We've had four different sanctions at the U.N. on Iran, three from the Bush administration, one here. And the only reason we got it is because Russia watered it down and prevented the — the sanctions from hitting the central bank. Mitt Romney proposed these sanctions in 2007. In Congress, I've been fighting for these sanctions since 2009. The administration was blocking us every step of the way. Only because we had strong bipartisan support for these tough sanctions were we able to overrule their objections and put them in spite of the administration. Imagine what would have happened if we had these sanctions in place earlier. You think Iran's not brazen? Look at what they're doing. They're stepping up their terrorist attacks. They tried a terrorist attack in the United States last year when they tried to blow up the Saudi ambassador at a restaurant in Washington, D.C.
And so in order solve this peacefully, which is everybody's goal, you have to have the ayatollahs change their minds. Look at where they are. They're moving faster toward a nuclear weapon. It's because this administration has no credibility on this issue. It's because this administration watered down sanctions, delayed sanctions, tried to stop us from putting the tough sanctions in place. Now we have them in place because of Congress. They say the military option's on the table but it's not being viewed as credible, and the key is to do this peacefully, is to make sure that we have credibility. Under a Romney administration, we will have credibility on this issue. Look, imagine had we let the Republican Congress work out the sanctions. You think there's any possibility the entire world would have joined us, Russia and China, all of our allies? These are the most crippling sanctions in the history of sanctions, period, period. When Governor Romney's asked about it, he said, we got to keep these sanctions. When they said, well, you're talking about doing more, what are you — are you — you're going to go to war? Is that you want to do now? VICE PRESIDENT BIDEN: (Inaudible) — and I — the interesting thing is, how they're going to prevent war. How are they going to prevent war if they say that there's nothing more that we — that they say we should do than what we've already done, number one? And number two, with regard to the ability of the United States to take action militarily, it is — it is not in my purview to talk about classified information. But we feel quite confident we could deal a serious blow to the Iranians. But number two, the Iranians are — the Israelis and the United States — our military and intelligence communities are absolutely the same exact place in terms of how close — how close the Iranians are to getting a nuclear weapon. They are a good way away. There is no difference between our view and theirs. When my friend talks about fissile material, they have to take this highly enriched uranium, get it from 20 percent up. Then they have to be able to have something to put it in. There is no weapon that the Iranians have at this point. Both the Israelis and we know we'll know if they start the process of building a weapon. So all this bluster I keep hearing, all this loose talk — what are they talking about? Are you talking about to be more credible? What — what more can the president do? Stand before the United Nations, tell the whole world, directly communicate to the ayatollah: We will not let them acquire a nuclear weapon, period, unless he's talking about going to war. REP. RYAN: — let's look at this from the view of the ayatollahs. What do they see? They see this administration trying to water down sanctions in Congress for over two years. They're moving faster toward a nuclear weapon; they're spinning the centrifuges faster. They see us saying, when we come into the administration, when they're sworn in, we need more space with our ally Israel. They see President Obama in New York City the same day Bibi Netanyahu is, and he's — instead of meeting with him goes on a — on a daily talk show. They see — when we say that these options are on the table, the secretary of defense walked them back. They are not changing their mind. That's what we have to do, is change their mind so they stop pursuing nuclear weapons, and they're going faster. REP. RYAN: We — we can debate a timeline. REP. RYAN: We can debate the timeline, whether there's — it's that short a time or longer. I — I agree that it's probably longer. Number two, it's all about credibility. MS. RADDATZ: What does that mean, "a bunch of stuff"? VICE PRESIDENT BIDEN: Well, it means it's simply inaccurate. VICE PRESIDENT BIDEN: No, we Irish call it malarkey. (Laughter.) But last thing: the secretary of defense has made it absolutely clear. He didn't walk anything back. We will not allow the Iranians to get a nuclear weapon. What Bibi held up there was when they get to the point where they can enrich uranium enough to put into a weapon, they don't have a weapon to put it into. VICE PRESIDENT BIDEN: I don't know what world you guys are in. REP. RYAN: Thank — thank heavens we have these sanctions in place. It's in spite of their opposition. REP. RYAN: They have given 20 waivers to this sanction. And all I have to point to are the results. They're four years closer toward a nuclear weapon. I think that case speaks for itself. VICE PRESIDENT BIDEN: By the way, they're — no, no, they are not four years closer to a nuclear weapon. MS. RADDATZ: You're acting a little bit like they don't want one, though. 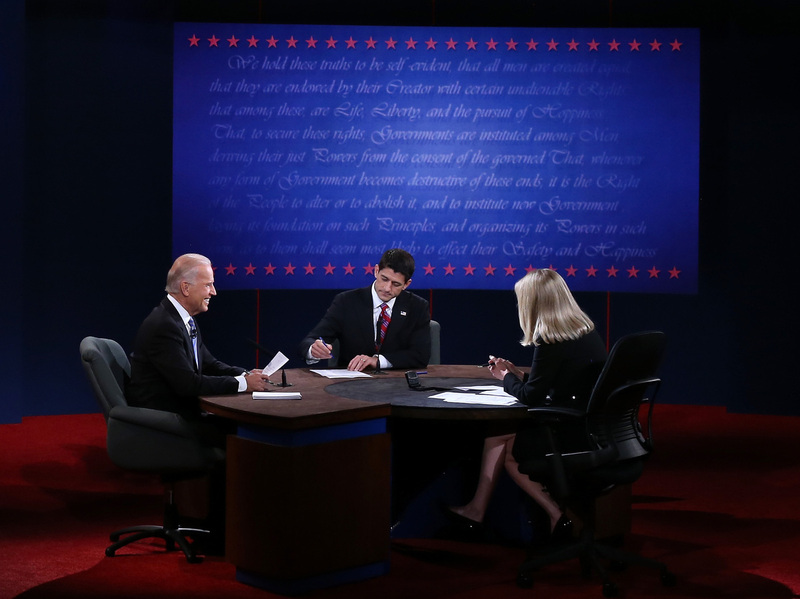 VICE PRESIDENT BIDEN: Oh, I didn't say — no, I'm not saying — (look? ), facts matter, Martha. You're a foreign policy expert. Facts matter. All this loose talk about them — all they have to do is get to — enrich uranium in a certain amount and they have a weapon — not true. Not true. They are more — and if we ever have to take action, unlike where we took office, we will have the world behind us, and that matters. That matters. MS. RADDATZ: What about Bob Gates' statement? Let me read that again: "Could prove catastrophic, haunting us for generations." REP. RYAN: And what it does is it — and it undermines our credibility by backing up the point when we make it that all options are on the table. That's the point. The ayatollahs see these kinds of statements, and they think, I'm going to get a nuclear weapon. When — when we see the kind of equivocation that took place because this administration wanted a precondition policy — so when the Green Revolution started up, they were silent for nine days. When they see us putting — when they see us putting daylight between ourselves and our allies in Israel, that gives them encouragement. When they see Russia watering down any further sanctions — and the only reason we got a U.N. sanction is because Russia watered it down and prevented these — (there ?) from being sanctions in the first place. So when they see this kind of activity, they are encouraged to continue, and that's the problem. MS. RADDATZ: What — let me ask you what's worse: war in the Middle East, another war in the Middle East, or a nuclear-armed Iran? REP. RYAN: I'll tell you what's worse. I'll tell you what's worse. REP. RYAN: — to wiping an entire country off the map. They call us the Great Satan. And if they get nuclear weapons, other people in the neighborhood will pursue their nuclear weapons as well. REP. RYAN: We can't live with that. VICE PRESIDENT BIDEN: War should always be the absolute last resort. That's why these crippling sanctions, what Bibi Netanyahu says we should continue — which, if I'm not mistaken, Governor Romney says we — we should continue. If I — I may be mistaken; he changes his mind so often, I could be wrong. But the fact of the matter is, he says they're working. And the fact is that they are being crippled by them. And we've made it clear, big nations can't bluff. This president doesn't bluff. VICE PRESIDENT BIDEN: I don't know how long it will take. Let's look at the — let's take a look at the facts. Let's look at where we were when we came to office. The economy was in free fall. We had — the Great Recession hit. Nine million people lost their job, 1.7 — $1.6 trillion in wealth lost in equity in your homes, in retirement accounts from the middle class. But it shouldn't be surprising for a guy who says 47 percent of the American people are unwilling to take responsibility for their own lives. My friend recently, in a speech in Washington, said 30% of the American people are takers. These people are my mom and dad, the people I grew up with, my neighbors. They pay more effective tax than Governor Romney pays in his federal income tax. They are elderly people who in fact are living off of Social Security. They are veterans and people fighting in Afghanistan right now who are, quote, not paying any taxes. I've had it up to here with this notion that 47 percent — it's about time they take some responsibility here. And instead of signing pledges to Grover Norquist not to ask the wealthiest among us to contribute to bring back the middle class, they should be signing a pledge saying to the middle class, we're going to level the playing field. We're going to give you a fair shot again. We are going to not repeat the mistakes we made in the past by having a different set of rules for Wall Street and Main Street, making sure that we continue to hemorrhage these tax cuts for the superwealthy. They're pushing the continuation of a tax cut that will give an additional $500 billion in tax cuts to 120,000 families. And they're holding hostage the middle-class tax cut because they say, we won't pass — we won't continue the middle-class tax cut unless you give the tax cut for the superwealthy. It's about time they take some responsibility. He's from Scranton, Pennsylvania. I'm from Janesville, Wisconsin. You know what the unemployment rate in Scranton is today? REP. RYAN: It's 10 percent. REP. RYAN: That's how it's going all around America. VICE PRESIDENT BIDEN: You don't read the statistics. That's not "how it's going." It's going down. MS. RADDATZ: (Inaudible) — two-minute answer, please. REP. RYAN: Look — (chuckles) — did they come in and inherit a tough situation? Absolutely. REP. RYAN: But we're going in the wrong direction! Look at where we are. The economy is barely limping along. It's growing at 1.3 percent. That's slower than it grew last year, and last year was slower than the year before. Job growth in September was slower than it was in August, and August was slower than it was in July. We're heading in the wrong direction. Twenty-three million Americans are struggling for work today. Fifteen percent of Americans are living in poverty today. This is not what a real recovery looks like. We need real reforms for a real recovery, and that's exactly what Mitt Romney and I are proposing. It's five-point plan. Get America energy-independent in North America by the end of the decade. Help people who are hurting get the skills they need to get the jobs they want. Get this deficit and debt under control to prevent a debt crisis. Make trade work for America so we can make more things in America and sell them overseas and champion small businesses. Don't raise taxes on small businesses, because they're our job creators. He talks about Detroit. Mitt Romney's a car guy. They keep misquoting him, but let me tell you about the Mitt Romney I know. This is a guy who — I was talking to a family in Northborough, Massachusetts the other day, Cheryl and Mark Nixon (sp). Their kids were hit in a car crash, four of them — two of them, Rob (sp) and Reid (sp), were paralyzed. The Romneys didn't know them. They went to the same church. They never met before. Mitt asked if he could come over on Christmas. He brought his boys, his wife and gifts. Later on he said, I know you're struggling, Mark (sp). Don't worry about their college; I'll pay for it. When Mark (sp) told me this story — because you know what, Mitt Romney doesn't tell these stories. The Nixons told this story. When he told me this story, he said it wasn't the help — the cash help; it's that he gave his time, and he has consistently. This is a man who gave 30 percent of his income to charity, more than the two of us combined. Mitt Romney's a good man. He cares about a hundred percent of Americans in this country. REP. RYAN: We want everybody to succeed. We want to get people out of poverty, in the middle class, on to lives of self-sufficiency. We believe in opportunity and upward mobility. That's what we're going to push for in a Romney administration. VICE PRESIDENT BIDEN: (Chuckles.) The idea, if you heard that — that little soliloquy on 47 percent, and you think he just made a mistake, then I think you're — I — I — I — I — I got a bridge to sell you. Look, I don't doubt his personal generosity, and I understand what it's like. When I was a little younger than the congressman, my wife was in an accident, killed my daughter and my wife, and my two sons survived. I have sat in the homes of many people who've gone through what I get through because the one thing you can give people solace is to know they know you've been through it, that they can make it. So I don't doubt his personal commitment to individuals. But you know what, I know he had no commitment to the automobile industry. He just let — he said, let it go bankrupt, period, let it drop out. All this talk — we saved a million jobs. Two hundred thousand people are working today. And I have never met two guys who are more down on America across the board. We're told everything is going bad. We have 5.2 million new jobs, private sector jobs. We need more, but 5.2 million — if they'd get out of the way, if they get out of the way and let us pass the tax cut for the middle class, make it permanent, if they get out of the way and pass the — pass the jobs bill, if they get out of the way and let us allow 14 million people who are struggling to stay in their homes because their mortgages are upside-down, but they never missed a mortgage payment — just get out of the way. REP. RYAN: Let's not forget that they came in with one-party control. When Barack Obama was elected, his party controlled everything. They had the ability to do everything of their choosing, and look at where we are right now. They passed a stimulus, the idea that we could borrow $831 billion, spend it on all these special interest groups and that it would work out just fine, that unemployment would never get to 8 percent. It went up above 8 percent for 43 months. They said that right now, if we just pass this stimulus, the economy would grow at 4 percent. It's growing at 1.3 (percent). REP. RYAN: Crony capitalism — (inaudible). REP. RYAN: This is the — this is the inspector general. REP. RYAN: On two occasions, we — we — we advocated for constituents who were applying for grants. REP. RYAN: That's what we do. We do that for all constituents who are — (inaudible) — for grants. VICE PRESIDENT BIDEN: I love that. I love that. This is such a bad program, and he writes me a letter saying — writes the Department of Energy a letter saying, the reason we need this stimulus — it will create growth and jobs. He — his words. And now he's sitting here looking at me — and by the way, that program — again, investigated — what the Congress said was, it was a model: less than four-tenths of 1 percent waste or fraud in the program. And all this talk about cronyism — they investigated, investigated; did not find one single piece of evidence. I wish he would just tell — be a little more candid. REP. RYAN: — and spend it on all these various different interest groups? VICE PRESIDENT BIDEN: Let me tell you it was a good idea. It was a good idea — Moody's and others said that this was exactly what we needed that stopped us from going off the cliff. It set the conditions to be able to grow again. We have — in fact, 4 percent of those green jobs didn't go under — or went — went — went under — didn't work. It's a better batting average than investment bankers have. They have about a 40 percent — (inaudible) — loss. VICE PRESIDENT BIDEN: And by the way, any letter you send me I'll entertain. MS. RADDATZ: Let's talk about Medicare and entitlements. Look, when I look at these programs, we've all had tragedies in our lives. I think about what they've done for my own family. My mom and I had my grandmother move in with us who was facing Alzheimer's. Medicare was there for her, just like it's there for my mom right now who's a Florida senior. After my dad died, my mom and I got Social Security survivors benefits. Helped me pay for college. It helped her go back to college in her 50s, where she started a small business because of the new skills she got. She paid all of her taxes on the promise that these programs would be there for her. We will honor this promise. And the best way to do it is reform it for my generation. You see, if you reform these programs for my generation, people 54 and below, you can guarantee they don't change for people in or near retirement, which is precisely what Mitt Romney and I are proposing. Look at what — look what "Obamacare" does. "Obamacare" takes $716 billion from Medicare to spend on "Obamacare." Even their own chief actuary at Medicare backs this up. He says you can't spend the same dollar twice. You can't claim that this money goes to Medicare and "Obamacare." And then they put this new "Obamacare" board in charge of cutting Medicare each and every year in ways that will lead to denied care for current seniors. This board, by the way, it's 15 people. The president's supposed to appoint them next year. And not one of them even has to have medical training. And Social Security, if we don't shore up Social Security, when we run out of the IOUs, when the program goes bankrupt, a 25 percent across-the-board benefit cut kicks in on current seniors in the middle of their retirement. We're going to stop that from happening. They haven't put a credible solution on the table. He'll tell you about vouchers. He'll say all these things to try and scare people. Here's what we're saying: Give younger people, when they become Medicare-eligible, guaranteed coverage options that you can't be denied, including traditional Medicare. Choose your plan, and then Medicare subsidizes your premiums, not as much for the wealthy people, more coverage for middle-income people and total out-of-pocket coverage for the poor and the sick. Choice and competition — we would rather have 50 million future seniors determine how their Medicare is delivered to them instead of 15 bureaucrats deciding what — if, where, when they get it. VICE PRESIDENT BIDEN: You know, I heard that death panel argument from Sarah Palin. It seems that every vice presidential debate, I hear this kind of stuff about panels. But let's talk about Medicare. What we did is we saved $716 billion and put it back — applied it to Medicare. We cut the cost of Medicare. We stopped overpaying insurance companies when doctors and hospitals — the AMA supported what we did. AARP endorsed what we did. And it extends the life of Medicare to 2024. They want to wipe this all out. It also gave more benefits. Any senior out there, ask yourself: Do you have more benefits today? You do. If you're near the doughnut hole, you have $600 more to help your prescription drug costs. You get wellness visits without copays. They wipe all of this out, and Medicare goes — becomes insolvent in 2016, number one. Number two, guaranteed benefit — it's a voucher. When they first proposed — when the congressman had his first voucher program, the CBO said it would cost $6,400 a year, Martha, more for every senior 55 and below when they got there. He knew that, yet he got it — all the guys in Congress, and women in the Republican party to vote for it. Governor Romney, knowing that, said, I — I — I would sign it were I there. Who you believe, the AMA? Me? A guy who's fought his whole life for this? Or somebody who had actually put in motion a plan that knowingly cut — added $6,400 a year more to the cost of Medicare? Now they got a new plan. Trust me, it's not going to cost you any more. Folks, follow your instincts on this one. And with regard to Social Security, we will not — we will not privatize it. If we had listened to Romney, to Governor Romney and the congressman during the Bush years, imagine where all those seniors would be now if their money had been in the market. Their ideas are old, and their ideas are bad, and they eliminate the guarantee of Medicare. REP. RYAN: Here's the problem. They got caught with their hands in the cookie jar turning Medicare into a piggy bank for "Obamacare". Their own actuary from the administration came to Congress and said one out of six hospitals and nursing homes are going to go out of business as a result of this. VICE PRESIDENT BIDEN: That's not what they said. REP. RYAN: Seven point four million seniors are projected to lose the current Medicare Advantage coverage they have. That's a $3,200 benefit cut. VICE PRESIDENT BIDEN: That didn't happen. VICE PRESIDENT BIDEN: More — more — more people signed up for Medicare Advantage after the change. VICE PRESIDENT BIDEN: No — nobody is getting shut down. REP. RYAN: Mr. Vice President, I know you're under a lot of duress — (laughter) — to make up for lost ground — (laughter) — but I think people would be better served if we don't keep interrupting each other. VICE PRESIDENT BIDEN: Well, don't take all the four minutes, then. REP. RYAN: Now let me just — let me say this. We are not — we are saying, don't change benefits for people 55 and above. They already organized their retirement around these promises. MS. RADDATZ: Let me ask you this: what is your specific plan for seniors who really can't afford to make up the difference in the value of what you call a premium support plan and others call a voucher? REP. RYAN: That's what we're saying. REP. RYAN: — these premium support payments by taking down the subsidies for wealthy people. Look, this is a plan — by the way, that $6,400 number, it was misleading then. It's totally inaccurate now. This is a plan that's bipartisan. It's a plan I put together with a prominent Democrat senator from Oregon. VICE PRESIDENT BIDEN: — not one Democrat who signed his plan. REP. RYAN: We — we put it — we put it together with the former Clinton budget director. REP. RYAN: This idea — this idea came from the Clinton commission to save Medicare, chaired by Senator John Breaux. Here's the point, Martha. REP. RYAN: If we don't — if we don't fix this problem pretty soon, then current seniors get cut! Here's the problem. Ten thousand people are retiring every single day in America today, and they will for 20 years. That's not a political thing. That's a math thing. VICE PRESIDENT BIDEN: Martha, if we just did one thing, if we just — if they allow Medicare to bargain for the cost of drugs like Medicaid can, that would save $156 billion right off the bat. REP. RYAN: Because it's working well right now. VICE PRESIDENT BIDEN: Look, I was there when we did that with Social Security, in 1983. I was one of eight people sitting in the room that included Tip O'Neill negotiating with President Reagan. We all got together, and everybody said, as long as everybody's in the deal, everybody's in the deal, and everybody is making some sacrifice, we can find a way. We made the system solvent to 2033. We will not, though, be part of any voucher plan eliminating — the voucher says, Mom, when you're — when you're 65, go out there, shop for the best insurance you can get; you're out of Medicare. You can buy back in, if you want, with this voucher, which will not keep pace — will not keep pace with health care costs, because if it did keep pace with health care costs, there would be no savings. That's why they go the voucher — they — we will be no part of a voucher program or the privatization of Social Security. REP. RYAN: A voucher is you go to your mailbox, get a check and buy something. Nobody's proposing that. Barack Obama, four years ago, running for president, said if you don't have any fresh ideas, use stale tactics to scare voters. If you don't have a good record to run on, paint your opponent as someone people should run from. Make a big election about small ideas. REP. RYAN: For younger people. What we said then and what I've always agreed is let younger Americans have a voluntary choice of making their money work faster for them within the Social Security system. REP. RYAN: That's not what Mitt Romney's proposing. What we're saying is no changes for anybody 55 and above. REP. RYAN: — slowly raise the retirement age over time. REP. RYAN: It wouldn't get to the age of 70 until the year 2103, according to the actuaries. VICE PRESIDENT BIDEN: Quickly, the bottom line here is that all the studies show that if we went with Social Security proposal made by Mitt Romney, if you're 40 — in your 40s now, you will pay $2,600 a year — you get $2,600 a year less in Social Security. If you're in your 20s now, you get $4,700 a year less. The idea of changing — and change being, in this case, to cut the benefits for people without taking other action you could do to make it work — is absolutely the wrong way. These — look, these guys haven't been big on Medicare from the beginning. Their party's not been big on Medicare from the beginning. And they've always been about Social Security as little as you can do. Look, folks, use your common sense. Who do you trust on this? A man who introduced a bill that would raise it $6,400 a year, knowing it and passing it, and Romney saying he'd sign it? Or me and the president? VICE PRESIDENT BIDEN: That's — there are the facts, right? MS. RADDATZ: OK. We're going to — we're going to move on to a very simple question to you both. REP. RYAN: Medicare and Social Security did so much for my own family. We are not going to jeopardize this program, but we have to save it for the next generation so it doesn't go bankrupt. VICE PRESIDENT BIDEN: You are jeopardizing the program. You're changing the program from a guaranteed benefit to a premium support. Whatever you call it, the bottom line is people are going to have to pay more money out of their pocket. VICE PRESIDENT BIDEN: And the families I know and the families I come from — they don't have the money to pay more out of — (inaudible). REP. RYAN: That's why we're saying more for lower-income people and less for higher-income people. MS. RADDATZ: — I won't get a very simple answer. But let me ask you this. VICE PRESIDENT BIDEN: I gave you a simple answer: He's raising the cost of Medicare. MS. RADDATZ: OK, on to taxes. If your ticket is elected, who will pay more in taxes? Who will pay less? And we're starting with Vice President Biden for two minutes. VICE PRESIDENT BIDEN: The middle class will pay less, and people making a million dollars or more will begin to contribute slightly more. Let me give you one concrete example: the continuation of the Bush tax cuts. We're arguing that the Bush tax cuts for the wealthy should be allowed to expire. Of the Bush tax cuts for the wealthy, 800 million — billion dollars of that goes to people making a minimum of a million dollars. We see no justification in these economic times for those — and they're patriotic Americans. They're — they're not asking for this continued tax cut; they're not suggesting it; but my friends are insisting on it. A hundred and twenty thousand families, by continuing that tax cut, will get an additional $500 billion in tax relief in the next 10 years, and their income is an average of $8 million. We want to extend permanently the middle-class tax cut for — permanently from the Bush middle-class tax cut. These guys won't allow us to. You what we're saying? We say let's have a vote. Let's have a vote on the middle-class tax cut, and let's have a vote on the upper tax cut. Let's go ahead and vote on it. They're saying no. They're holding hostage the middle-class tax cut to the super wealthy. And on top of that, they got another tax cut coming that's $5 trillion that all of the studies point out will, in fact, give another $250 million dollar — yeah, $250,000 a year to those 120,000 families and raise taxes for people who are middle-income with a child by $2,000 a year. This is unconscionable. There is no need for this. The middle class got knocked on their heels. The Great Recession crushed them. They need some help now. The last people who need help are 120,000 families for another — another $500 billion tax cut over the next 10 years. REP. RYAN: Our entire premise of these tax reform plans is to grow the economy and create jobs. It's a plan that's estimated to create 7 million jobs. Now, we think that government taking 28 percent of a family and business' income is enough. President Obama thinks that the government ought to be able to take as much as 44.8 percent of a small business' income. Look, if you taxed every person in successful small business making over $250,000 at a hundred percent, it'd only run the government for 98 days. If everybody who paid income taxes last year, including successful small businesses, doubled their income taxes this year, we'd still have a $300 billion deficit. You see, there aren't enough rich people and small businesses to tax to pay for all their spending. And so the next time you hear them say, don't worry about it, we'll get a few wealthy people to pay their fair share, watch out, middle class. The tax bill is coming to you. That's why we're saying we need fundamental tax reform. Let's take a look at it this way: 8-out-of-10 businesses, they file their taxes as individuals, not as corporations. And where I come from, overseas, which is Lake Superior — (chuckles) — the Canadians — they drop their tax rates to 15 percent. The average tax rate on businesses in the industrialized world is 25 percent, and the president wants the top effective tax rate on successful small businesses to go above 40 percent. Two-thirds of our jobs come from small businesses. This one tax would actually tax about 53 percent of small-business income. It's expected that'd cost us 710,000 jobs. And you know what? It doesn't even pay for 10 percent of their proposed deficit spending increases. REP. RYAN: — it's been discredited by six other studies, and even their own deputy campaign manager acknowledged that it wasn't correct. MS. RADDATZ: Well, let's talk about this 20 percent. MS. RADDATZ: You have refused yet again to offer specifics on how you pay for that 20 percent across-the-board tax cut. Do you actually have the specifics, or are you still working on it, and that's why you won't tell voters? MS. RADDATZ: Do you have the specifics? Do you have the math? Do you know exactly what you're doing? VICE PRESIDENT BIDEN: That'll be — that'd be a first for the Republican Congress. REP. RYAN: — so we can lower tax rates across the board. VICE PRESIDENT BIDEN: I hope I'm going to get time to respond to this. MS. RADDATZ: I — you'll get time. REP. RYAN: I'll come back in a second then, right? VICE PRESIDENT BIDEN: First of all, I was there when Ronald Reagan tax breaks — I mean, he gave specifics of what he was going to cut, no — number one, in terms of tax expenditures. Number two, 97 percent of the small businesses of America pay less — make less than $250,000. Let me tell you who some of those other small businesses are: hedge funds that make 6(00 million dollars), $800 million a year. That — that's what they count as small business because they're passthrough. Let's look at how sincere they are. Ronald — I mean, excuse me, Governor Romney, on "60 Minutes," I guess it's about 10 days ago, was asked, Governor, you pay 14 percent on $20 million. Someone making $50,000 pays more than that. Do you think that's fair? He said, oh, yes, that's fair; that's fair. This is — and they're going to talk — I mean, you think these guys are going to go out there and cut those loopholes? The loophole — the biggest loophole they take advantage of is the carried interest loophole and — and capital gains loophole. They exempt that. VICE PRESIDENT BIDEN: How's that? REP. RYAN: It is mathematically possible. It's been done before. It's precisely what we're proposing. REP. RYAN: It's been done a couple of times, actually. VICE PRESIDENT BIDEN: Oh, now you're Jack Kennedy. VICE PRESIDENT BIDEN: That's right. REP. RYAN: I understand aren't used to doing bipartisan deals. VICE PRESIDENT BIDEN: — here — here are the things we're going to cut. This is what he said. VICE PRESIDENT BIDEN: That's coming from the Republican Congress working bipartisanly? REP. RYAN: Mitt Romney was governor of Massachusetts, where 87 percent of the legislators he served with were Democrats. He didn't demonize them. He didn't demagogue them. He met with those party leaders every week. REP. RYAN: He reached across the aisle. He didn't compromise principles. VICE PRESIDENT BIDEN: — why isn't he even contesting Massachusetts? MS. RADDATZ: Vice President, what would you suggest — what would you suggest beyond raising taxes on the wealthy that would substantially reduce the long-term deficit? VICE PRESIDENT BIDEN: Not — just let the taxes expire like they're supposed to on those millionaires. We don't — we can't afford $800 billion going to people making a minimum a million dollars. They do not need it, Martha. Those 120,000 families make $8 million a year. Middle-class people need the help. Why does my friend cut out the tuition tax credit for them? Why does he go out after the child — (inaudible)? VICE PRESIDENT BIDEN: — their mortgage deduction impacted? Guarantee? VICE PRESIDENT BIDEN: — would not be affected. REP. RYAN: It — it taxes a million small businesses, who are our great job creators. VICE PRESIDENT BIDEN: I wish I'd get it — the greatest job creators are the hedge fund guys. MS. RADDATZ: And you're going — and you're going to increase the defense budget. MS. RADDATZ: And you're going to increase the defense budget. VICE PRESIDENT BIDEN: They're going to increase it $2 billion — $2 trillion. MS. RADDATZ: More than that. No — so no massive defense increase? REP. RYAN: No, we're saying is, don't — OK, you want to get into defense now? MS. RADDATZ: — because that's another math question. MS. RADDATZ: Let's put the automatic defense cuts aside. OK? MS. RADDATZ: Let's put those aside. No one wants that. VICE PRESIDENT BIDEN: I'd like to go back to that. VICE PRESIDENT BIDEN: Who's cutting it by a trillion? REP. RYAN: We're going to cut 80,000 soldiers, 20,000 Marines, 120 cargo planes. We're going to push the Joint Strike Fighter out. The choice is clear: a stagnant economy that promotes more government dependency, or a dynamic, growing economy that promotes opportunity and jobs. Mitt Romney and I will not duck the tough issues. We will not blame others for the next four years.